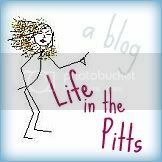 Life in the Pitts: Stop Lurking! Ok. I'll be brave. My name is Tiffany, and I live in Colorado. I started blogging so I could comment on my friends' blogs. I mainly write about the chaos that ensues with three little girls, but sometimes I write about what's on my heart. I read your blog because I love your sarcasm and wit! You make me laugh! Oh, and the stick figures. I like stick figures. This is Jen. I am a mom of 4 from the Ohio. I have been reading your blog ever since I did an advertising order for one of your giveaways a long time ago. I love the stick figures, by the way, and your humor. Your posts never fail to bring a smile to my face, even if I don't ever comment. I'll go too. My name is Michelle, a mom of 3 in Ohio. I know the Pringles and a funny RSS feed title when I was visiting their blog awhile ago. I love your sense of humor. I love the stick figures. Yours is one of the funniest, most honest blogs I've read! I'm a Jen as well living in Grand Rapids, MI. I work full time, have three children and a hubby plus I am am going to school part time for my Master's degree. I stop by when I see your posts in my feed because you are funny and funny people draw me back. I have enough other stress so yeah...your sense of humor is why I'm here! I'll take a turn too. I'm Deb in Toronto, Canada. I'm a stay-at-home mother of two and I run my own business in my 'spare' time. I don't remember how I found your blog but I always read it when I see you in my feed because you make me laugh! Hi, I'm Katie. I teach high school, because that's what they pay me to do, but I'd much rather be scrapbooking! I'm Holly from Portsmouth, UK. I comment every now and then. I found the blog when you briefly joined a forum that I frequent. You seemed funny and interesting so I kept lurking. I am a Coastguard and although I have blogs, I rarely update. Well, you already know I comment...so I'm not really a lurker. Its' Kmama, or Kristi, from Michigan. Mom of 2, wife, career woman, blogger over at The Daily Dribbles. I love your humor and sarcasm, so you're always drawing me back. I'm Non Sequitur Chica. I live in CT but we are selling our house and moving to Chicago this summer. Hi! I'm Vanessa and I'm a professional blog lurker, but here I am commenting at your request. I live in Erie, PA with my husband and our giant dog. I've been reading your blog for a while now because you make me laugh and people who make me laugh are my favorite. I was first drawn in by your post when you were doing your stick figures dancing at work. LOVED all the song choices and made me laugh, so I stuck around. Also, we follow each other on Pinterest and like a lot of the same things, so there's that. I'm reading from Virginia Beach, Va.. My name is Laura & I really have no idea how I stumbled upon your blog, just that I have not been able to stay away. Love reading about your family & since I am also pregnant with my first- your pregnancy! I comment every once in a while and I feel like we are friends. Wow that sounds a little creepy. I promise I'm not creepy. Well we are at least Blogging friends, and Pinterest friends. I found your blog a LONG time ago while you were doing a few crafty things. You are the only blog that I actually read that I have never met. I die laughing at almost every post. My husband now knows you by name because I tell him your funny stories. Sometimes he asks "Is this is your real friend or the one in Pittsburgh that you don't know". We live in Gilbert AZ and have 3 kids. Hi, I'm Kimberly. I've been around for a long time. I found your blog through a link party for some creative thing or other. I stayed because you made me laugh. And then I weeded out my "blogs to follow" list. And you made the cut. That's how much you made me laugh. So. Yeah. Let's see. A close friend would say I am happy and like to laugh and am creative. An enemy would say I am overly dramatic. If they were really mean they'd point out the 50 pounds I packed on after I learned how to cook. I write a crafty blog with stuff about kid's crafts, sewing, crafting, DIY, photography, cooking, baking, etc, etc. I think I already mentioned I read you cuz you're funny? I do not have any backhair, thank goodness because that would make me barf. And by the way, I totally guessed you were pregnant well before you announced it to the blogging public. I thin it was because I follow you on pinterest too. So. nice to meet you. I am Andrea.. Hillary up above from Gilbert is my good friend. She's not creepy, I promise. She told me about your blog and your stick figueres, more than once, so I decided to look for myself! Your hilarious! Keep the posts a coming! Hi! I'm Bry. I was born in Wisconsin and moved to Utah. I'm a maker, employee, crafter, blogger, wife, mother of 1 awesome little dude and video game expert. I'm 2nd oldest of 6 and my husband and I won the (not really a) race to give my parents their 1st grandbaby. think I found you from UCreate and started following you. Once I found you I decided we should be friends, so I've been your friend for a while already. I like reading your blog cuz you're funny and cute. i don't have anything to say that's not already been said- elisabeth- mom to three- you break up my diaper changing days with stories i relate to- keeps me smiling- i blog to share pics of my cute kids with their far away grandparents. keep writing please. My name is Kara. You were my YCL at girls camp in the Grand Rapids Stake in Michigan. I love reading your blog because you have such a humorous outlook on life. I've recently loved reading the blogs about Syndil because I am a new aunt to a beautiful niece and I have a nephew on the way. Someday I will be a mommy and it's nice to get the insights of others. I'm delinquent in posting this - which is rather fitting, unfortunately, as I always seem to be running behind. I'm Jenn. I'm from Texas. I do not own a horse, wear cowboy boots, have a cactus in my yard, or own chaps. I do, however, use the word "y'all" a tad excessively. I hope my friends would describe me as compassionate, sincere, loyal, and honest, but I guess you never know for sure. ;) I write a blog, when I make the time for it, about whatever I'm up to in life - usually DIY home projects/crafts. It's really more of a sort of journal to document what goes on in my life so that I will remember, and so that others who are interested can peek in...whenever I update it. I cannot for the life of me remember how I found your blog. But, like many others said, I stayed because you made me laugh; and I thought we might be friends if ever our paths crossed in real life. I just know so many of the things you do are things I have done, or would have done, or wished I had been brave enough to do, or will likely do in the future - especially the embarrassing ones. I'm also a new mommy, and have to say that your mommy posts have had me howling with laughter -- I even read several of them out loud to the hubby. As of yet, no backhair to report - I am hopeful this will remain the case for a long time to come.